Named by National Geographic Adventure Magazine as one of the 50 Great Adventure Towns, Mountain View, AR is home to Loco Ropes, an Arkansas ziplining course. 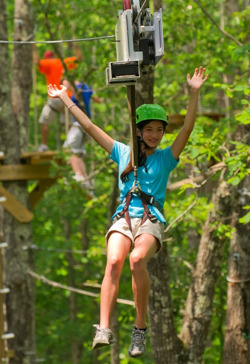 Loco Ropes is a treetop adventure park experience, with a thrilling high-wire adventure rope course. The course features 3 different segments totaling 30+ challenges to test your nerve, endurance, agility, and strength. Click here to learn more about Loco Ropes on their website.